The brooch gets its name from the Russian Empress Maria Alexandrovna, the empress consort of Czar Alexander II, Emperor of Russia (1855-81), who purchased the 260.37-carat enormous Sri Lankan (Ceylon) blue sapphire at the Great London Exhibition held in 1862, and presented it to his empress. The sapphire was subsequently set as the centerpiece of a brooch that also consisted of 56.60 carats of smaller diamonds. The “Maria Alexandrovna Blue Sapphire” is a 260.37-carat, oval-cut blue sapphire of Sri Lankan origin. The stone is exceptional in that it combines desirable characteristics of color, clarity , cut as well as size. The stone has an evenly distributed medium-dark saturated blue color so characteristic of the best quality Sri Lankan sapphires. The sapphire has dimensions of 6.0 cm x 5.3 cm. In the list of 17 large Sri Lankan blue sapphires greater than 100 carats in weight, the “Maria Alexandrovna Blue Sapphire” occupies the 9th position as seen in the table below. Some areas of Sri Lanka also produce the famous corn-flower blue sapphires so characteristic of the famous and elusive Kashmir blue sapphires. These sapphires have the unique velvety blue color of the Kashmir sapphires. One area that produced these high quality sapphires was Rakwana, in the traditional gem producing district of Sri Lanka known as Ratnapura. The Rakwana blue sapphires are the exact look alike of Kashmir blue sapphires, that even several recognized gem testing laboratories in the west originally issued reports certifying them as Kashmir sapphires. Most Sri Lankan sapphires show an orange-red fluorescence when exposed to long wave length ultra-violet light. Sapphires from other regions of the world are generally inert to ultra-violet light. Thus the presence of fluorescence in a blue sapphire in ultra-violet light may indicate that the sapphire is of Sri Lankan origin. One of the commonest solid inclusions found in Sri Lankan sapphires is Zircon. The grains of Zircon are rounded and form haloes known as Zircon haloes. Other inclusions in sapphires include rutile, apatite and spinel. The 260.37-carat blue sapphire was purchased by Czar Alexander II, Emperor of Russia, when he visited the Great London Exhibition held in 1862. The exhibition was held between May 1st to November 1st, 1862, in South Kensington, London, on the same site that now houses the Natural History Museum and the Science Museum. The Exhibition that featured over 28,000 exhibitors from 36 countries, covered recent advances in the fields of heavy and light industries such as the Bessemer process for steel manufacture, science and technology such as the development of photography and telegraphic communications, chemical industries such as the discovery of aniline, that revolutionized the development of drugs and dyes. Other exhibits included art works, sculpture, household items such as furniture, plates, silver and glass wares, and decorative items, such as rugs, carpets, wall paper, utility items such as clothing and fabrics, Jewelry and ornaments including gems and precious stones. The total number of visitors that attended the exhibition, during the six months period it was held, was just over 6 million. Czar Alexander II, Emperor of Russia purchases the sapphire at the Great London Exhibition. The 260.37-carat blue sapphire of Sri Lankan origin was probably exhibited in the “Ceylon stall” by one of the reputed gem dealers of Sri Lanka at that time. Sometimes it would have been exhibited by a reputed gem and jewelry dealer of London, who had imported the blue sapphire from Sri Lanka. Emperor Alexander II who saw the enormous blue sapphire was so impressed, that he thought it would make an ideal gift for his Empress consort Maria Alexandrovna. The Emperor then purchased the gemstone for an undisclosed sum, and gifted it to his wife. The Emperor’s marriage to Maria was so successful that she bore him 8 children, 6 boys and 2 girls. But, in later years, in 1866, the Emperor gets romantically involved with a young princess Yekaterina Dolgorukaya, whom he finally marries after the death of Empress Maria in 1880. Czar Alexander II ascended the throne of Russia at the age of 36, after the death of his father in 1855, during the Crimean war. Alexander was forced to conclude peace in 1856 on ignominious terms, and revealed his countries backwardness when compared to other advanced countries like England and France. Alexander embarked on a program of modernization of Russia, to catch up with the other European Powers. He first started with the development of transport and communications, and began the rapid development of the railway network, which in turn hastened economic development by faster movement of agricultural produce and other goods from areas of production to areas of consumption, and to the port cities for faster exports. The railway system which had only 965 km of track in 1855 expanded to 22,525 km at the time of his death in 1881. Alexander’s greatest achievement was the abolition of serfdom in Russia, that gave personal freedom to millions of suppressed people, who also received land allotments on which they could start their own farming and become independent citizens. This move by Alexander II was considered the greatest social movement since the French Revolution. Other achievements of Alexander II included judicial reforms, local government reforms, that set up elected local councils, whose self governing areas were extended to include improved local welfare such as education, medical care, hygiene, agronomy and local crafts. Village schools set up by the local councils helped to increase the rate of rural literacy. He also reorganized the military and introduced conscription making military service compulsory for all young men. He released all political prisoners, removed disabilities placed on religious groups such as the Jews, abolished restrictions on foreign travel, and cruel medieval punishments. In spite of all his liberal policies, Alexander was a firm believer in the autocratic rule of the Monarch, and later use this power to suppress several uprisings including activities of a terrorist organization called the People’s Will, who finally plotted and carried out his assassination in 1881, in spite of the fact that the Emperor had expressed his willingness to introduce constitutional reforms. Thus Alexander II goes down in the history of Russia as a great historical figure whose achievements rank in importance with those of both Peter the Great and Vladimir Lenin. Alexander II commissions his court jewelers to set the 260.37-carat blue sapphire in an appropriate brooch setting. The court jewelers who undertook the task eventually turn out an exquisitely crafted brooch in gold and silver, with an intricate design. The overall shape of the brooch is oval, and the large oval-shaped blue sapphire, which is the centerpiece of the brooch is set slightly displaced from the center, towards one side. The blue sapphire is surrounded by two rows of diamonds. The first row that surrounds the large blue sapphire immediately all round, consists of 40 square-shaped small diamonds. The second row that is outside the first row, consists of 18 cushion-cut white diamonds, which are smaller on the displaced side of the sapphire and larger on the opposite side. In between the two rows on the lower side there is a crescent shaped incomplete row that fills the gap between the two rows, taking the side towards which the sapphire is displaced, as the upper side. The total weight of the diamonds is 56.60 carats. Maria Alexandrovna died in 1880 and two years after her death the brooch was presented to the diamond fund. Today, the brooch is exhibited at the State Diamond Fund of the Russian Fedration, and bears the Inventory No. AF-67. In the year 1997, the Jewels of the Romanovs from the Russian Diamond Fund was brought to the United States and exhibited in several cities such as Washington D. C., Houston, San Diego, and Memphis, to commemorate the 125th anniversary of the Russian Grand Duke Alexi’s visit to the United States. The exhibits consisted of 115jewels and uncut gems, and the highlight of this exhibition was the Maria Alexandrovna brooch, made up of the 260.37-carat Sri Lankan blue sapphire and other diamonds. 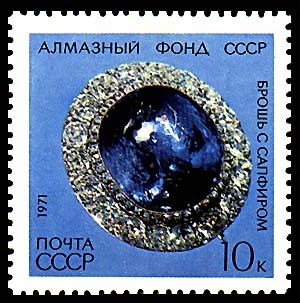 In the year 1971 the U. S. S. R. paid tribute to the Maria Alexandrovna brooch by featuring it on a special postage stamp, 90 years after the death of the Empress. GEO347K GEM STONES – Corundum – Department of Geological Sciences, University of Texas, Austin.